As my airplane touched down onto the tiny tarmac in Tangier, I was surprised with a familiar view of palm trees swaying against the blue sky. At first, it reminded me of my hometown, Santa Monica, but as I began to acclimate to my new surroundings, taking notice of all the men in hooded robes hurrying to the mosque and the women in headscarves selling live chickens for dinner, all of my hometown familiarity quickly vanished. In the blink of an eye, I was engulfed in the sights and sounds of the exotic land known as Morocco. There is a sense of freedom, curiosity and playfulness when journeying to distant places—new synapses are triggered, epiphanies emerge and our hearts expand. 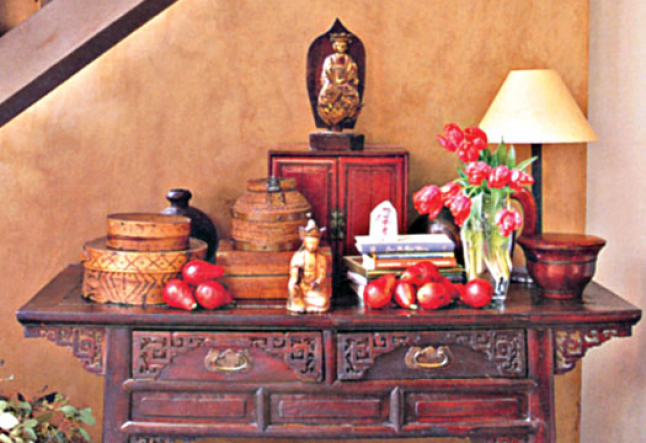 Bringing home special mementos from places that have profound impacts on our lives us is vital to keeping the energy of these important voyages alive.Feng shui is an ancient Chinese method of arranging and decorating your home for health, happiness and prosperity. 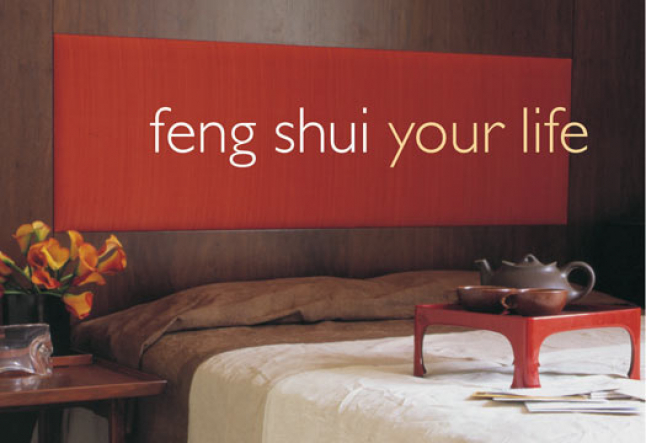 Before you can apply good feng shui, you must know what you want to manifest in your life. Is it more peace, love, prosperity, health, spirituality, travel or a combination of all these things? Once you are clear about what you desire, you can be purposeful in designing a space that supports your unique life vision. Whether it’s a painting discovered in a Guatemalan art gallery, seashells gathered on a New Zealand coastline, textiles acquired during a foray into a remote Indian village or the smallest relic or sculpture purchased for posterity, you can display them in your home and gain increased happiness and well-being. From a feng shui standpoint, each memento contains the energy imprint of the country, which includes also the energy of the artisan who designed it and the memory of how you were feeling while traveling on your journey. Giving a seminar in Marrakech was the impetus and highlight for my foray into Morocco, and I was delighted when a participant offered to trade me a vintage Moroccan wedding blanket for a feng shui consultation. These wool blankets can take a year for a family to hand sew, and because they are traditionally offered for a daughter’s nuptials, I have placed this blanket in my bedroom so that it can serve the original intention of its creation. My other cherished keepsake is a silver tea set. Every morning when I serve a cup of tea, it brings back the fun memory of haggling for thirty minutes with a shop owner in the most famous souk in Marrakech. When you display travel mementos with purpose, it helps you to remain open to the positive changes that can happen in life. 1. Create an intention for your voyage. This means not only earmarking a guidebook for the best museums or restaurants, but also envisioning what you want to experience and explore and bring home, spiritually, from the trip. 2. Forego the typical touristy knickknacks. Instead, choose items that arise from special moments during your stay. I bought colorful perfume bottles because they reminded me of a concert I attended in Tangier. The performers sprinkled rose water on the audience using these types of bottles. 3. Buy from local craftsman and artisans. Supporting their creativity and offering a fare price is good karma. Also, it’s better to own hand-made objects such as woven baskets and rugs. They contain life force energy, as opposed to machine-made objects. 4. Look for stones and shells which contain nature’s healing energy. 7. 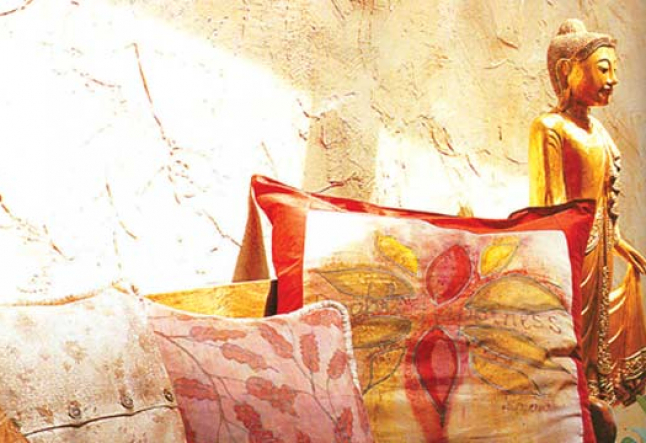 Look for colorful textiles like pillow covers, place mats and small wall-hangings that are easy and light for packing. 8. Remember what you want to manifest in your life, and find mementos that represent your passions and desires. For example, to boost romance, buy in pairs, such as two candlesticks, pictures or figurines. To encourage fertility and pregnancy, find a hand-made doll crafted by a loving mother. To increase spirituality, bring home a religious relic or statue. To boost wealth, buy a special gold box to house your written intentions. • Place “love” mementos in your bedroom. For example, add a pair of red candles to your night stand. In addition, you can place love items in the Love Center, which is the far right-hand corner of the room as you stand in the doorway. • Place “wealth” mementos on the left-hand side of your desk or in the Wealth Center. The Wealth Center is the far left-hand corner of any room as you stand in the doorway. • Place “health and fertility” mementos in the very center of your home. This middle area is your Health Center. • Place “spiritual” mementos inside your front door on the right-hand side. This area is called the Helpful People Center. Pictures of spiritual places, teachers, deities and angels are excellent choices for this space. Each day as you come and go from your home, it is important to feel the blessings and guidance from the helpful energy sources in your life. No matter where your journey takes you, make it your intention to bring back objects that energize both you and your environment. 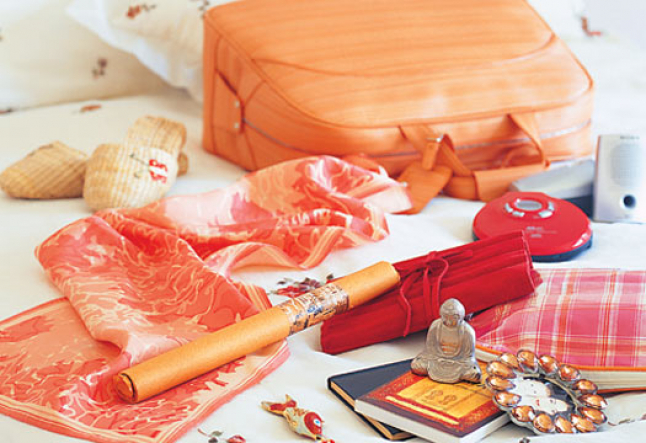 Whether you cruised in the Galapagos, practiced yoga in Bali or shopped in Paris, your travel keepsakes will encourage you to continue manifesting your desires. I must say, as much as I love to travel, I am always happy when my plane touches down in Los Angeles because for me, there’s no place like home!